Sports Costs > How Much Does a Surfboard Cost? How Much Does a Surfboard Cost? All surfboards aren’t created equally. With many types available, for both beginners and professionals, the prices can vary quite a bit depending on the exact type you’re looking for. At the Ron Jon Surf Shop, for example, their featured shortboard, midlength and longboards retail for $150 to $450, but the balsa boards retail for $5,000. The best sellers on Amazon.com, while not designed for professionals, retail for $65 to $250. Costco, at the time of writing this guide, had two eight foot long surfboards for $150. A replacement or a backup fin/s can cost anywhere from $20 to $150, depending on your board’s brand. These fins are necessary to help control the board while surfing, and most surfboards today, regardless of the brand you purchase, can come with a removable fin system, which means the fin can be removed easily, allowing you to swap one of your choice. A leash can cost $20 to $45, and while some surfboards may come with one, some surfers opt to purchase one they are comfortable with. Wax will provide a grip for the surfer, and a good pack can cost about $10 to $20. A board bag, designed to protect your surfboard on the go and from the sun, can cost $50 to $200 or more. If you plan on traveling long distances with your surfboard, a roof rack will be necessary since it can’t fit inside of a standard trunk. A good surfboard roof rack can cost about $100 to $200. Some surfers also ship their surfboard to a destination, which can cost about $20 one-way via FedEX or UPS. A wetsuit or board shorts are also highly recommended to avoid rashes and to keep you warm in cooler waters. A good wetsuit and can cost $40 to $150, while board shorts can be about half this. According to SurfBait.com, your weight plays an important role when selecting your new surfboard. The heavier you are, the larger your board needs to be. If you are too heavy, it can be harder to control it, creating quite the challenge while riding the waves. 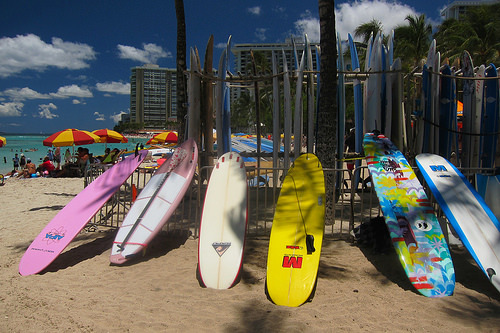 When choosing a surfboard, refer to a size guide to see which size you need to comfortable surf. If you’re just learning and curious about the sport, consider renting before investing hundreds of dollars. However, if you’re going to rent, experts recommend finding a “real” surfboard, not those you commonly see at a tourist destination. Most rentals are less than $20 per hour. Buying used can often save you up to 50 percent, even when you factor in the shipping fees if you were to purchase online. Consider checking out eBay and Craigslist to see if you can find a board that suits your tastes.